I have exciting news to share! So recently, I have been OBSESSED with getting a pet bird. And, while I sadly cannot announce news that has to do with fulfilling that dream, due to my mom, I did get a little gig working at a bird shop in Denver, called the Exotic Bird Emporium. 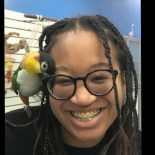 Not only do I get to hold and take care of birds, but I also get to clean cages, and help promote the bird shop on social media! But, you may be thinking, what does it look like, what do they sell, and what kinds of birds are there? Well, first off, Exotic Bird Emporium is in a little corner on E IIiff Avenue. And a general overview of what the exotic bird emporium sells is bird feed, treats, toys, harnesses, cages, grooming and boarding services, and of course the feathered friends themselves. I’m going to introduce you to some of the birds at the shop, and a couple days from now I’m going to do a post on everything about pet birds! I took many pictures of the different birds and some displaying their personalities, which you can see as well if you go to the exotic bird emporium website. Birds fall on a spectrum. I like to think of three main categories that each species fits into. And, of course, there are some “grey bird” areas where some of the species don’t entirely fit into one category. It all really depends on the individual bird, especially their temperament, and size. This category is generally defined by the types of birds that you keep in a cage and can’t really pet or cuddle with, per say. They also tend to be smaller and have a more skittish personalities than their larger counterparts. Parakeets, finches, sparrows, and canaries all generally fall into the category of a small-sized bird. And if you are looking for a bird that you can cuddle, hold or otherwise have lots of contact with, these small birds are not necessarily the right kind of bird for you, due to the fact that they tend to keep to themselves more and do not like to be touched, although you can stumble upon the occasional bird owner who has a finch or canary that is comfortable being touched by their owner. However, there are some exceptions to the general rule that species such as canaries and parakeets are small, more cage-based birds; while the Budgerigar is a species that is more of a skittish bird, parakeet species such as the Indian Ringneck and Monk Parakeet are more similar to medium-level care birds. You can find parakeets, finches, and canaries at the Exotic Bird Emporium. Most of the time, the birds that fit into these categories are the small parrot species; such as Caiques, Cockatiels, Lovebirds, Indian Ringnecks, and Conures are all birds. Just in general, they tend to be more cuddly and lovable (or at least as much as a bird can be) than the skittish parakeets. They also have more singing and talking ability than cage birds. These types of birds are often the most popular because they allow for holding and petting, but don’t require nearly as much care as the cockatoo or macaws. These birds often tend to vary in temperament depending on personality and species. The Exotic Bird Emporium sells cockatiel and other parrot babies, as well as cockatiel, lovebird, and conure adults. These are the birds that require the most attention and care, and they look it too! These birds include Cockatoos, Amazon Parrots, and Macaws. Nobody in their right mind would recommend them to a beginner, due to the fact that they can have a very deep complexity depending on past, personality, and intelligence. In addition, a danger of these birds is that they have very strong beaks, unlike the medium sized, which can’t do much damage, and the cage birds, which are hardly a concern for injuries at all. These birds, especially cockatoos, can be loud and display profound emotion, having been described as “living with a perpetual two year old child”. However, if you know what you’re doing, this shouldn’t discourage you; they can make a great companion for people who can handle them. At the Exotic Bird Emporium, the birds that are often the most attractive to people are the cockatoos and macaws, but you have to prove that you can take care of them! Come out to the Exotic Bird Emporium! And make sure to follow them on Facebook, Twitter, and Instagram, and stay tuned to their website! This entry was posted on December 4, 2018 by kidsanimalstation in Advice/Reviews, Animal Facts and tagged birds, Canaries, cockatiel, Cockatoos, Denver Business, Exotic Bird Emporium, Macaws, Parakeets, parrot.